SpaceX’s CRS-15 Dragon spacecraft has completed the EOM (End Of Mission) phase with a splashdown in the Pacific Ocean on Friday. As per usual – though still unusual for International Space Station (ISS) vehicles – Dragon and her important downmass will be recovered. Release from the Space Station Remote Manipulator System (SSRMS) occurred at 12:38 Eastern, less than six hours ahead of a successful splashdown. The CRS-15 Dragon was launched on the final Block 4 version of the Falcon 9 rocket just over a month ago. Docking with the ISS a few days later. The cargo craft carried 1,233 kilograms (2,718 lb) of scientific experiments, 205 kilograms (452 lb) of provisions for the crew, 178 kilograms (392 lb) of hardware for the US orbital segment of the outpost, 12 kilograms (26 lb) of hardware for the Russian part of the station, 21 kilograms (46 lb) of computer equipment and 63 kilograms (139 lb) of hardware to support future spacewalks. In Dragon’s trunk was NASA’s Ecosystem Spaceborne Thermal Radiometer Experiment (ECOSTRESS), an ecological research payload that was extracted and mounted outside the space station during Dragon’s stay – and is now set to monitor the temperature of plant life on Earth’s surface. Dragon’s Trunk also transported a replacement Latching End Effector (LEE) for the space station’s CanadArm2 robotic arm. It is from a current LEE on the SSRMS that will release Dragon to begin the journey home. On Thursday, ISS Partners and mission managers polled “go” for release thanks to favorable weather conditions forecast in the splashdown zone. Dragon’s hatch was closed early Friday around 4 a.m. Eastern time. Robotic ground controllers then used the robotic arm to detach Dragon from the Earth-facing port of the Harmony module around 6:30 a.m. Eastern time and will maneuver Dragon into the release position. With Expedition 56 Flight Engineer Serena Auñón-Chancellor of NASA monitoring Dragon’s systems, the ground controllers released Dragon from the SSRMS at 12:38 p.m. Eastern time. 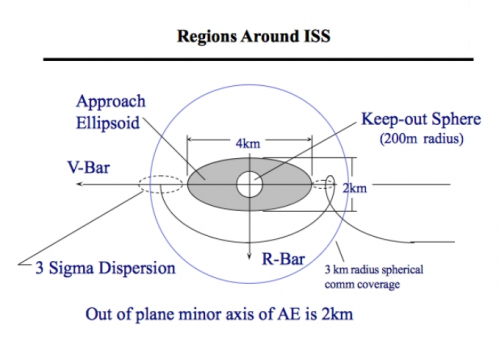 As Dragon pushed down the R-Bar, the largest of the three thruster departure burns imparted enough Delta Velocity (Delta-V) change to Dragon to push it outside of the approach ellipsoid. This includes the closure of the Guidance Navigation and Control (GNC) bay door on Dragon, creating a perfect thermal protection seal around the entirety of Dragon for entry. At 5:23 p.m. Eastern time, SpaceX flight controllers at Hawthorne, California commanded Dragon’s Draco thrusters to fire for 12 minutes and 53 seconds – retrograde – in the deorbit burn that enabled Dragon to slip out of orbit for its descent back to Earth. 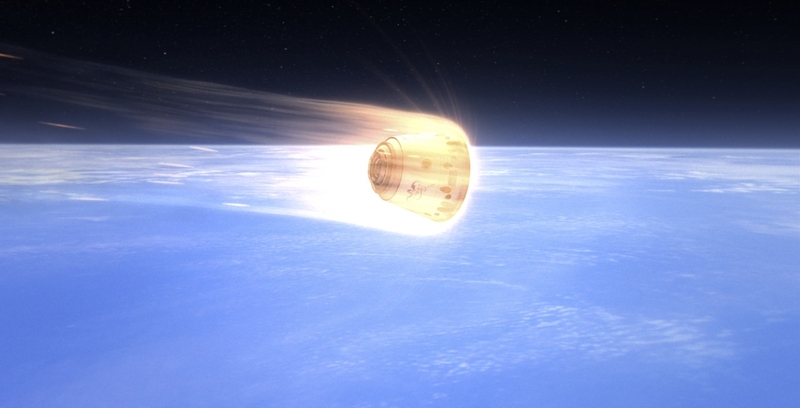 Dragon then placed its heat shield out in front in preparation for Entry Interface (EI) – the moment Dragon reached the first traces of Earth’s upper atmosphere. Recovery is attained by three main recovery vessels which were positioned near Dragon’s return location. The main recovery vehicle had already set sail earlier this week. Fast recovery vessels deploy to begin collecting Dragon’s parachutes as recovery of the capsule itself was conducted by the primary recovery assets. Dragon’s parachute-assisted splashdown occurred around 6:17 p.m. Eastern time, 3:17 p.m. Pacific time, about 410 miles southwest of Long Beach, California. 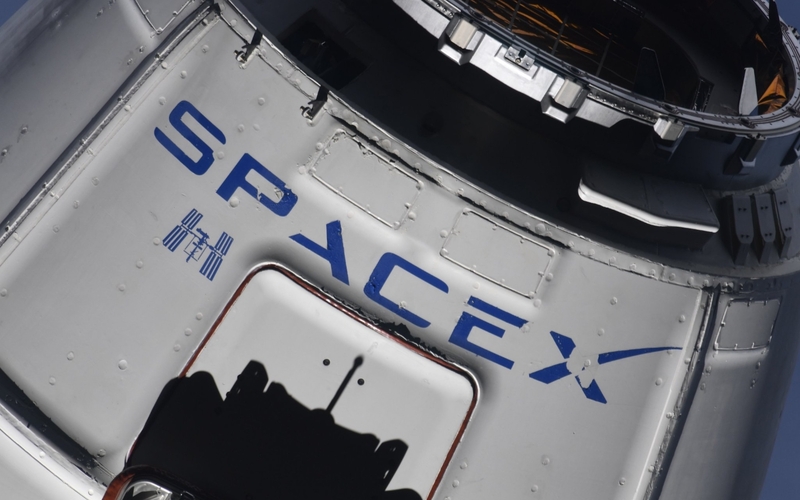 It will take about two days for Dragon to be brought back to the Port of Los Angeles for its cache of cargo and scientific experiments to be unloaded. The ISS crew spent the majority of the second half of Dragon’s stay loading Dragon’s pressurized capsule with key items to be returned to Earth, including numerous time-sensitive experiments, which will be the first items to be removed. Dragon will eventually take a road trip to SpaceX’s test center at McGregor in Texas for the complete cargo removal. CRS-16 is the next Dragon mission to the ISS, currently scheduled for late November. This will be the first time Dragon will have flown on the Block 5 version of the Falcon 9.